Greetings from Switzerland on this gorgeously sunny, spring day! I hope you all are enjoying as nice weather as we are. It was so difficult to get me to come in off the balcony, so I could get back to my blogging and house work, but I am dying to share with you all my quilting news. 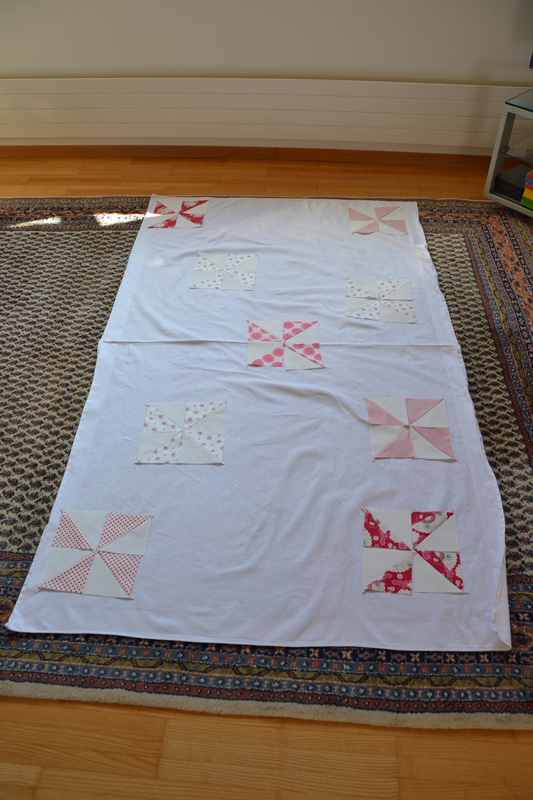 For the last two and a half weeks, I have been busy with a couple of new quilts: one for a quilt along, which I will mention in my next post; and the other which has turned out to be an experimental project. 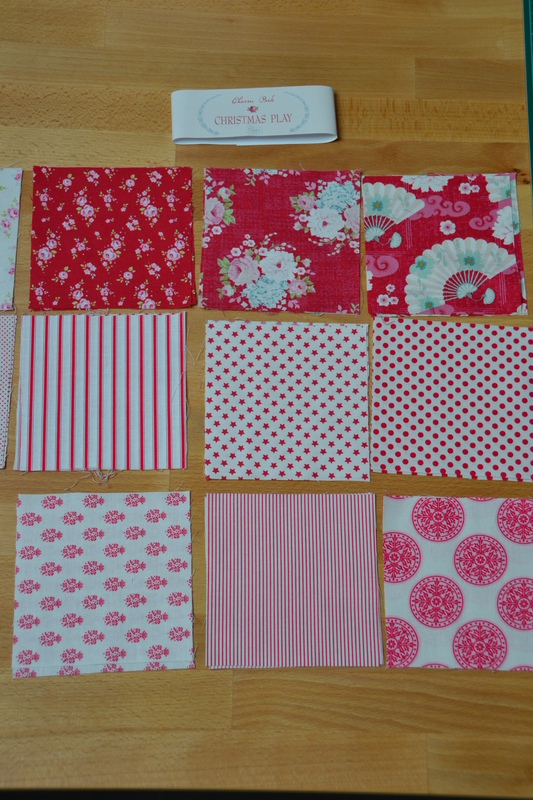 After having spent ages trying to decide what my next quilt would be, and needing a bit of practice before I started on the Quilt Along, I decided I would just take that Tilda “Christmas Play” charm pack I got before Christmas and just start doing something easy with them, something I already knew how to make and was comfortable with: half-square triangles. If you are in Switzerland you can purchase the fabric from The Quilt Place’s online shop http://www.the-quiltplace-shop.ch/produktleser/product/charm-pack-christmas-play.html. The other fabric I am using for this quilt is “Prinzessin” (which is translated as Princess) from a German fabric company Westfallen Stoffe. 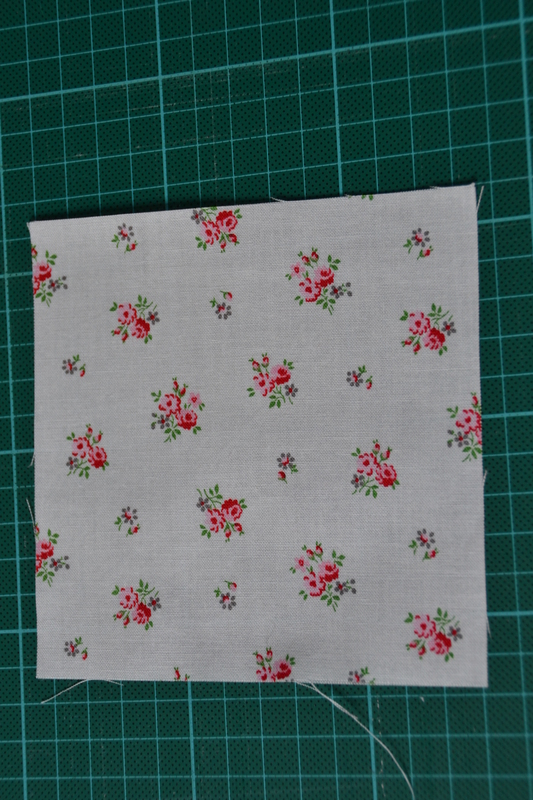 If you remember, I had sworn off the sewing machine just before Christmas, so after about two months of not touching my sewing machine, I decided it was high time that I ‘face my fears’ and get back to it. 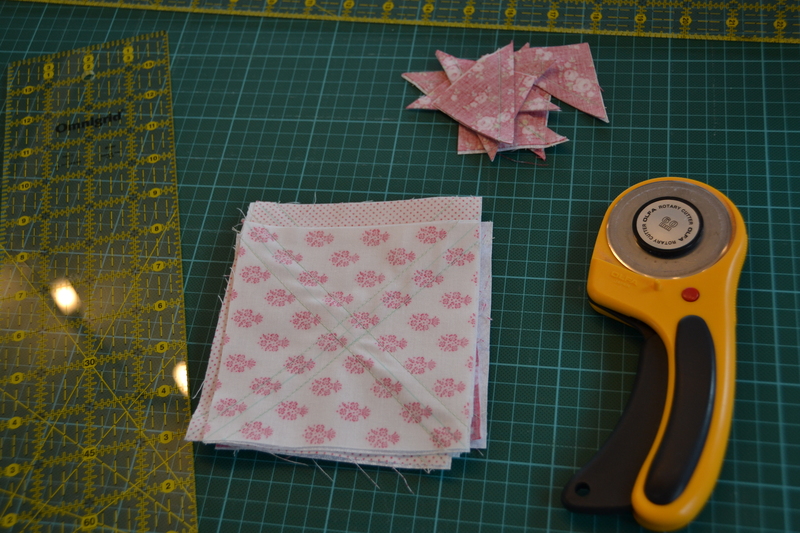 Needing a bit of a refresher course on the sewing machine, I signed up for the Craftsy class “Pre-cut Piecing Made Simple” with Camille Roskelley. http://www.craftsy.com/quilting?_ct=wberqbdql-sqjuweho&_ctp=quilting. I already have one of her books and so I thought her clear and simple instructions would be perfect to get me back on track with my sewing. Aside from her amazing Swoon block quilt, I was attracted to this course because of the half-square triangle quilt, which encourages a bit of creativity by giving you different suggestions of ways you can arrange half-square triangles. So after doing that lesson I got down to the business of making my half-square triangles. I first started with larger ones and then got bored and started making really tiny ones. 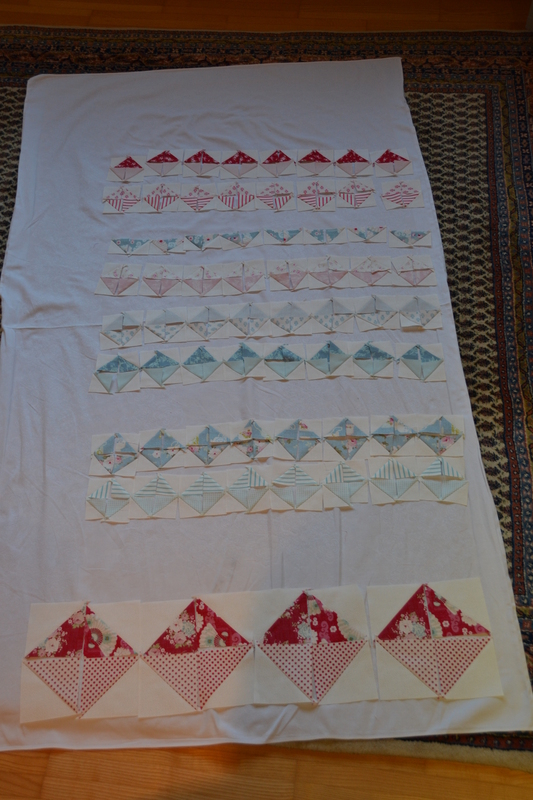 Once they were all together I finally got started with the fun part, arranging my half-square triangles. This I did on a sheet on the floor in front of the television as I don’t have a design board yet. The problem was figuring out what to do with the big blocks which seemed to be huge in comparison to my tiny little ones. I eventually decided that the blocks should probably be used on two separate different quilts, unless, I make a pillow out of the big ones or something. 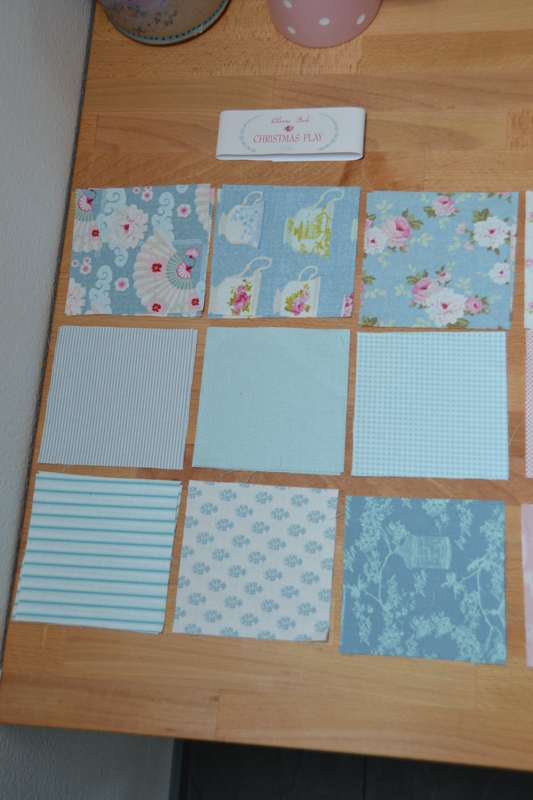 In any case I still haven’t firmly decided what I am going to do for the quilt but I certainly enjoyed playing around with a few ideas. Of course it was a bit painful doing this on the floor, but it really gives you the perspective that you can’t get, with it on the table. Of course these were just ideas, I would in any case need a lot more half-square triangles to make a decent sized throw. 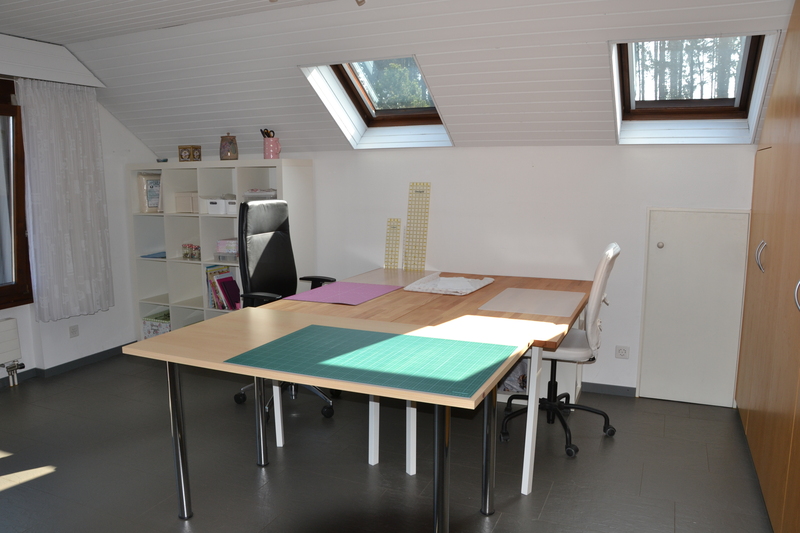 Aside from actually sewing, I have finally reclaimed my old office /sewing space on the 2nd floor as my official sewing retreat. The room I set up in the basement after Christmas I have now deemed as our office, as it is just too dark to sew in at the moment. 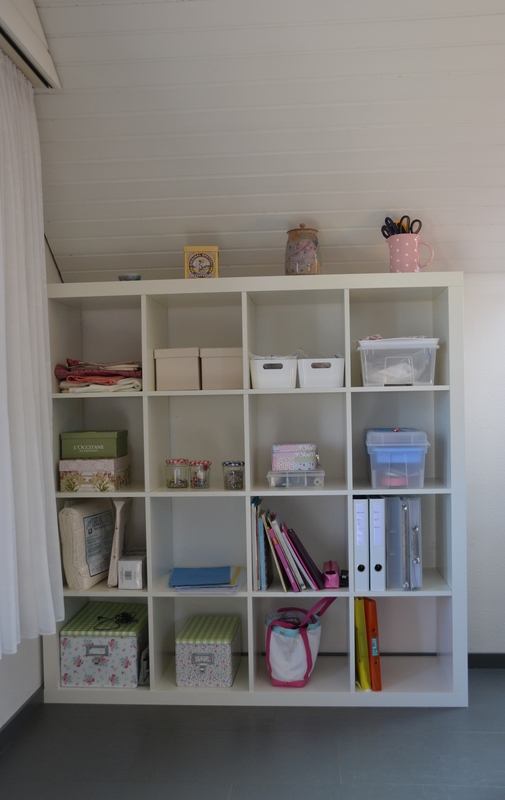 Now, in my new sewing retreat, I have all the space I could dream of and lots of light. It’s so great! I love spending time in there, especially in the mornings when it gets the best light. 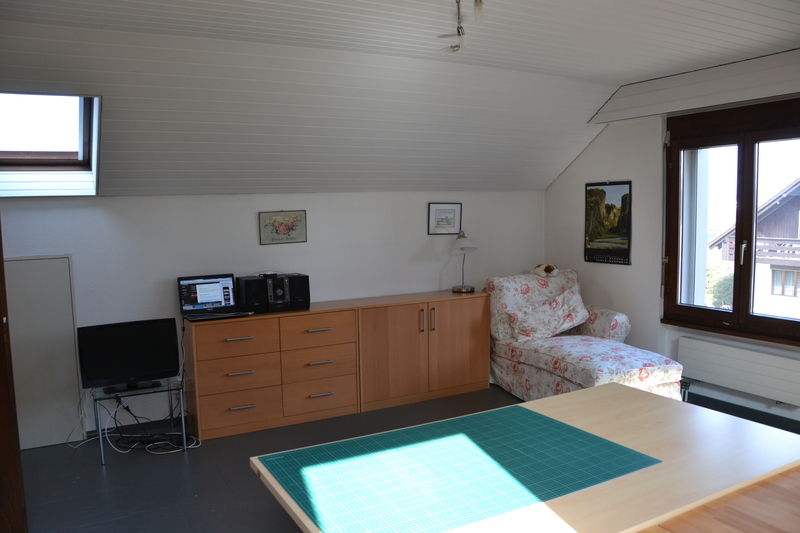 I now have a desk for cutting, one for my machine and one for piecing and there is still plenty of room for the ironing board to stay up all the time, if I choose. 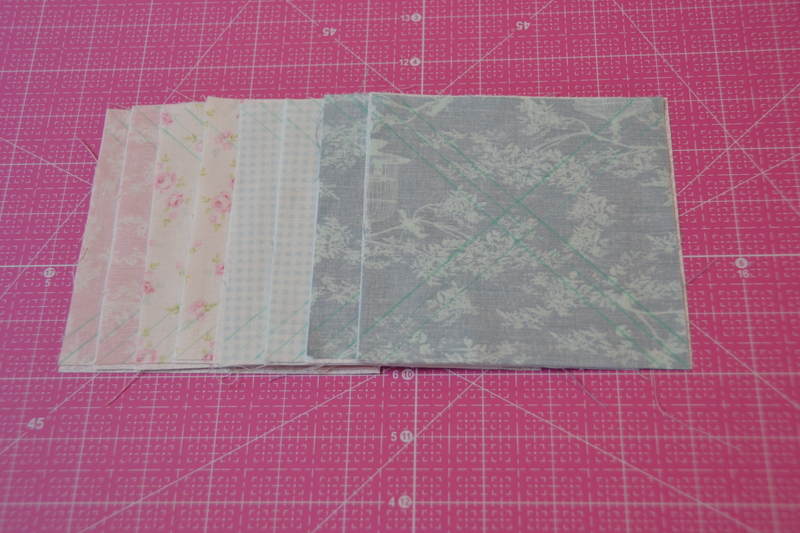 So I guess that is all my quilty news for you. The only other thing would be a funny thing that happened one day when I was working at my machine. 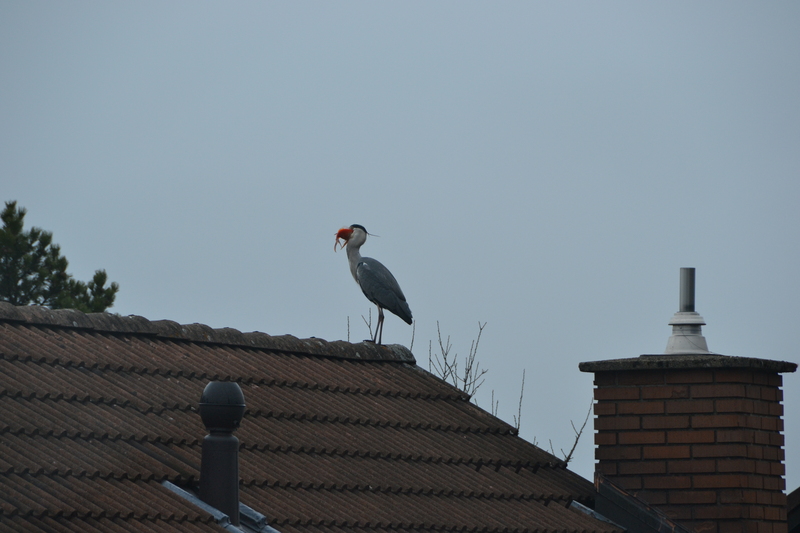 I looked out the window and suddenly saw this bird, I thought it was a stork as we have those in the area, but upon closer observation I would say it is probably a type of heron. 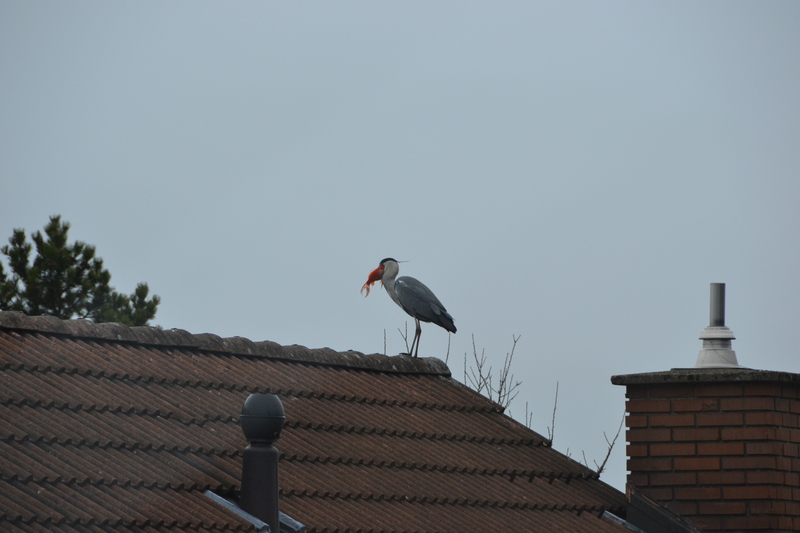 It looks like he had a nice brunch on one of my neighbor’s fancy goldfish or koi. 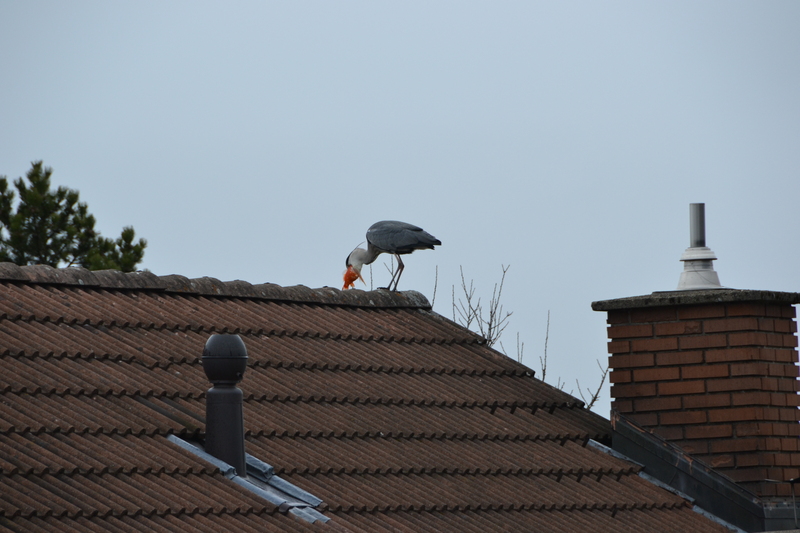 Mind you I never actually saw him succeed at swallowing his catch! Well I hope you enjoyed a bit of my quilting news and let me know what kinds of things you’ve been up to! I would love to hear from you. I wonder if this goes straight to your email or more as a comment. 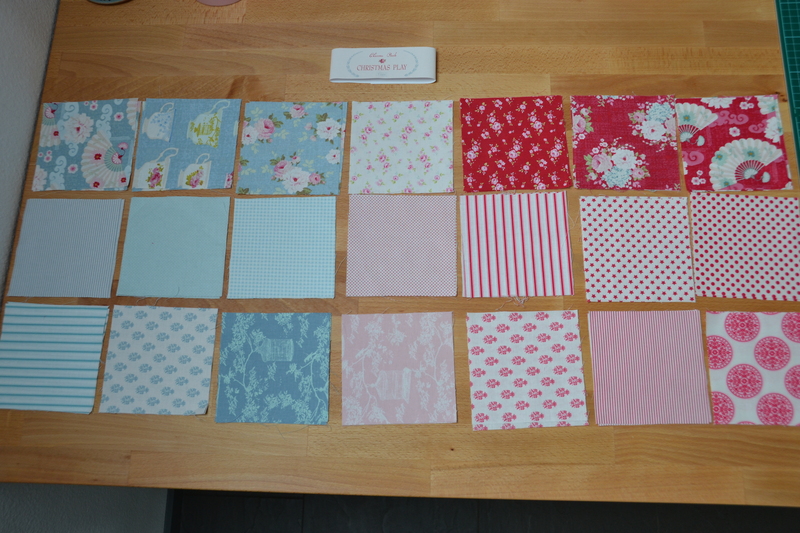 Either way I love being able to keep up to date on you sewing. I have another art show I’m painting! I would love to show you the same way you show us how it is coming along! Jeeze! all the amazing opportunities to undertake with all the technology! Maybe…one day… or do i just get started? anyways my other fear is taking on too much. i just started my masters and i do not wnat to ill my time too much. although really… sometimes i think that is better for my silly seemingly ADD personality. so i’m going now to start a paper about my personal mission statement. Hi Robyn, yeah this is a comment but it also goes to my email. Thanks so much, it is great to get comments especially from you! Just talked to your mom who told me all the great news in your life. Congratulations. Oh and I would wait with the project of starting some sort of online venue if you are soo busy with this online degree. It’s a lot of work. Unless you are just talking about an etsy shop maybe that is not so bad. But I’m so proud of you. But don’t forget you need your sleep. Don’t forget about your health missy! By Robs, can’t wait to see you.